NOD-IN-1 is a potent mixed inhibitor of nucleotide-binding oligomerization domain (NOD)-like receptors, NOD1 and NOD2, with IC50 of 5.74 μM and 6.45 μM, respectively. Troxerutin, also known as vitamin P4, is a tri-hydroxyethylated derivative of natural bioflavonoid rutins which can inhibit the production of reactive oxygen species (ROS) and depress ER stress-mediated NOD activation. Arglabin is a sesquiterpene gamma-lactone is isolated from Artemisia glabella; anticancer natural compound. Afuresertib is an orally available, ATP-competitive, pan-AKT inhibitor with Ki of 0.08, 2 and 2.6 nM against AKT1, AKT2 and AKT3, respectively. CY-09 is an NLRP3 inhibitor. 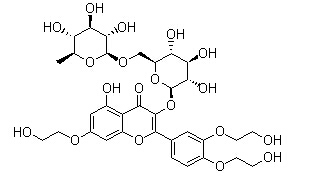 MCC950(CP-456773) is a potent, selective, small-molecule inhibitor of NLRP3 with IC50 of 7.5 nM in BMDMs. CP-456773, also known as MCC950 and CRID3, is a potent and selective cytokine release inhibitor and NLRP3 inflammasome inhibitor for the treatment of inflammatory diseases. CP-456773 inhibits interleukin 1β (IL-1β) secretion and caspase 1 processing. INF39 is an irreversible and noncytotoxic NLRP3 inhibitor.